I am pleased to announce another FREE lecture on 6/6/2009. Not so coincidentally, the publication of my revised and updated dissertation “From Slaves to Sons” in Chinese by Tien Dao will happen soon after this event. Please join me in celebration of my publication. This lecture will show some of the parallels between the Galatian problem and the some of the issues facing North American Chinese churches. Galatians was my PhD dissertation. I hope to show relevance between scholarly study and application in this lecture. I believe Paul’s gospel still speaks to us today. There is plenty of seating. Feel free to grab your Cantonese Christian friends. Professor Noh is frequently quoted in the media as an expert on Korean reunification. In this lecture, he will detail the ideology of “Juche” that lies behind North Korea’s “collective solidarity” and will go on to argue that Korean reunification could lead to economic prosperity. From a theological perspective, he will explore how Christianity could play a role in establishing peace on the Korean peninsula. This panel will invite local religious leaders in the Asian American Christian community to discuss the role of their religious organizations in the early beginnings of the Asian American Movement. Additionally, these leaders will discuss the current role of Asian American Christian faith and religion in shaping current discourse in the Asian American Movement and in Asian American Studies. Rev. Lloyd Wake, retired United Methodist minister and Asian American community activist. For more information about this event series or USF Asian American Studies, please contact Prof. Kevin Chun, Program Director (415.422.2418, email Kevin), or Andrea Wise, Program Assistant (415.422.5983, email Andrea). For more information about this particular panel, go to the ISAAC blog. There has been a great deal of talk in recent years suggesting that we have entered a “post-secular” age. Much of this is a response to the resurgence of politicized religion on the world scene. But what, if anything, does the term “post-secular” even mean? Have we really entered into a post-secular age? And if so, what implications, if any, does this have for the social sciences? Do these developments imply a new approach to the study of religion? A wholesale reconstruction of social science? A shift towards social philosophy? Is there such a thing as “post-secular social science”? This conference brings together a number of analysts of religion and its entanglements with the world in an attempt to assess these questions. We will address the possible meanings of religion and of the various terms with roots in the term “secular”: secularism, secularity, secularization. Without some grappling with the question of what religion is, it is very difficult to say what secularity or secularization might entail. We will explore the extent to which the “return of religion” is a product of an actual upsurge of religiosity around the world as opposed to greater scholarly attention to religion. We will also examine the ways in which the global religious situation may compel us to reconsider how we think about both religion and social science. Conveners: Philip Gorski, John Torpey, David Kyuman Kim. Conference sponsors: The MacMillan Center Initiative on Religion, Politics, and Society; The Center for Comparative Research at Yale University; Social Science Research Council; co-sponsored by The Graduate Center, City University ofNew York. The conference is free and open to the public. No registration is required. For further information, please contact the conference coordinator, Ateş Altınordu [Email Ates]. ISAAC is delighted to announce the inauguration of “Religion and Theology in Asian America” (RTAA) lectureship in 2009. ISAAC, in partnership with colleges, universities and seminaries across North America, will sponsor talks by scholars and practitioners who specialize in Asian American Religion and Theology (with special attention to Christianity). We are in conversation with U.C. Berkeley, University of San Francisco, and Fuller Theological Seminary about hosting at least three lectures in 2009. For our “speakers pool,” we are interested in identifying scholars or practitioners who can address a wide range of issues that intersect with the experiences of Asian Christians in North America (e.g, the civic engagement practices of Asian American Catholics, Protestants, and evangelicals; trans-national and diasporic aspects of religion and theology in Asia America; the impact of the North American context on ethnic Asian spirituality and religious practices; reflections on the intersections or disconnections between the study of race, gender, politics, and religion in Asian American studies; etc.). ISAAC also seeks donors who would like to make these lectures more widely available. We estimate a budget of $5,000 for each lecture. You may direct your gifts to this lecture – go to isaacweb.org for more information or to make an on-line gift. If you represent an educational institution that is interested in hosting a lecture, if you are interested in becoming a member of the “speakers pool,” or if you are interested in contributing to the lectures, please email Tim Tseng for details. 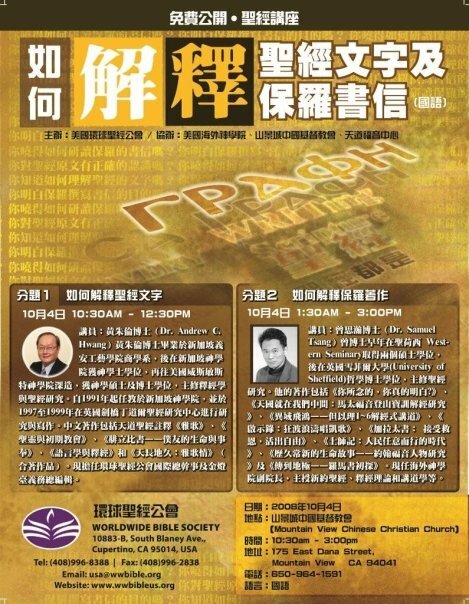 Worldwide Bible Society, the translators of the New Chinese Translation is pleased to announce a one-day FREE seminar conducted by Prof. Andrew Hwang of Singapore Bible Society and Dr. Sam Tsang who taught many Bay Area pastors now, on Oct. 4 from 10.30am to 3 pm at Mountain View Chinese Christian Church (175 E. Dana St. Mt. View, CA 94041, contact phone: 408-996-8388). Prof. Hwang who is also the head of the translation committee for WBS will discuss the meanings of biblical Greek words from a linguistic point of view from 10.30-12 and Dr. Tsang will respond in the afternoon (1.30-3) to show how Prof. Hwang’s method can fit into his own method of studying Paul. The seminar will be conducted in Mandarin. All are welcome. I’d like to announce the following event to be held at UC Berkeley (see below). Rebecca Kim is a good friend and colleague who has recently published a study of second-gen Korean American evangelicals. If you live in the Bay Area or know people at UC, could you spread the word about this exciting talk? God’s New Whiz Kids? focuses on second-generation Korean Americans, who make up the majority of Asian American evangelicals, and explores the factors that lead college-bound Korean American evangelicals—from integrated, mixed race neighborhoods—to create racially segregated religious communities on campus. Kim illuminates an emergent “made in the U.S.A.” ethnicity to help explain this trend, and to shed light on a group that may be changing the face of American evangelicalism, both at home and abroad.